Boğaziçi University President Gülay Barbarosoğlu and a committee of academicians from the University met with officials from prominent universities in Boston and Chicago on September 17-24, 2015, with a view to enhancing Boğaziçi University’s international collaboration with these universities. The committee comprised Professor Ali İzzet Tekcan, Provost; Professor Taner Bilgiç, Vice Provost; Professor Taylan Akdoğan, Dean of the Faculty of Arts and Sciences; and Asu Nisa Kırdar, Global Outreach Coordinator. 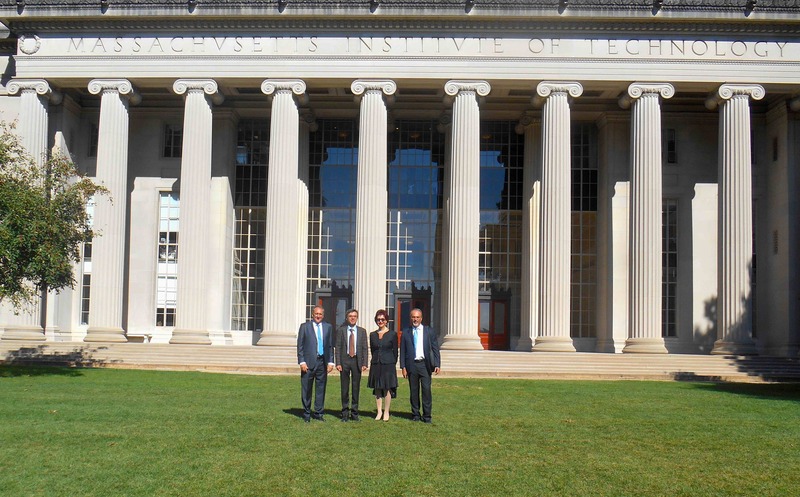 The Boğaziçi University committee visited the Massachusetts Institute of Technology (MIT), Harvard, Chicago and Northwestern universities in Boston and Chicago. During their visits with officials from these universities, several proposals for collaboration in common areas of work were discussed and important steps were taken to strengthen the cooperation between BU and these universities. The committee’s first visit in the United States was to the Massachusetts Institute of Technology (MIT), where they met with MIT President Rafael Reif and Vice Provost for International Activities Richard Lester. Among those present at the meeting was Dr. Kenan Şahin, guest of honor of the University’s 148th commencement ceremony, holder of an Honorary Doctorate from BU, entrepreneur and life member of MIT Board of Trustees. During the meeting, participants evaluated thecompatibility of student and faculty profiles of the two universities, and discussed common research and collaboration areas that might emerge in the context of possible solutions to global problems such as climate change, forced migration, earthquakes and violence linked to nature/climate. During their visit to MIT, the group also met with Chancellor Cynthia Barnhart, Vice President for Research Maria T. Zuber, and Dean of the School of Humanities, Arts and Social Sciences Melissa Nobles. The meeting with Vice President for Research Maria T. Zuber focused on earth sciences, earthquakes, climate and environmental issues. President Gülay Barbarosoğlu stated that developing joint projects focusing on basic issues that affect daily life were crucial, and emphasized the importance of investing in basic sciences. In this context, creating an environment of collaborative research would lead to the establishment of incubation centers and technology zones with an emphasis on intellectual property rights, and would be beneficial for all parties involved. Boğaziçi University’s important role as a bridge between cultures and continents was also underlined. At the meeting with Melissa Nobles, Dean of School of Humanities, Arts and Social Sciences, Nobles elaborated on potential areas of cooperation in the fields of Political Science, Global Studies, Languages, and Linguistics. She emphasized the importance of partnerships in areas that require diligent work, such as identifying the causes and effects of migration, one of the most pressing challenges of our age. During the meetings with Chancellor Cynthia Barnhart and Sanjay Sarma, Dean of Digital Learning, possibilities of joint course developments for online and interactive courses were discussed. The meetings with Lester Richmond and Bernd Widdig, Directors of International Affairs, focused on internship opportunities for students of both universities and possibilities of joint summer school projects. At Harvard University, the committee met with Huntington Lambert, Dean of Harvard Extension School. In addition to the “Second Spring Academy” program offered by BU’s Lifelong Learning Center in cooperation with Harvard University, possible collaborations on a joint summer school and programs for professionals were discussed during the meeting. The BU Committee’s meetings in the US proceeded with a visit to the University of Chicago, where Dr. Kenan Şahin was also present. President Robert J. Zimmer, Provost Eric D. Isaacs and Vice President for Global Engagement Ian H. Solomon hosted the meeting at the University of Chicago. Social Sciences and Humanities, and Natural Sciences were discussed among prominent areas of possible collaboration between the institutions. President Gülay Barbarosoğlu emphasized the importance of Boğaziçi University as a regional partner in research projects related to energy, climate change, natural sciences, and geophysics. In their visit to Northwestern University in Chicago, the committee met with Devora Grynspan, Director of International Program Development and Assistant to the President for Global Initiatives and Ayça Alemdaroğlu, Director of the Keymen Center for Turkish Studies at Northwestern University, and evaluated new programs intended for instructors and students. The BU committee also met with Chicago based IES Abroad, an organization that regularly sends special students to BU. During the meeting, the possibility of including Boğaziçi University students in IES Abroad’s global internship programs was discussed. The Committee’s visit to the US also included meetings with over 100 BU graduates who are studying or pursuing professional careers in the US. President Gülay Barbarosoğlu and the BU Committee members met with BU graduates residing in Boston on September 19th and in Chicago on September 23rd.